Everyone knows it’s more fun to run outside, the same thing goes for stretching! 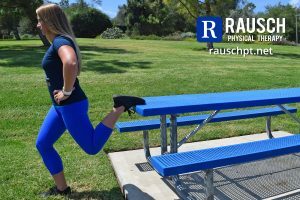 PT Ashley Heller shows how you can use picnic benches to help reduce running pain, avoid chronic injury, and improve recovery time while you’re out on a run. I’m an outdoor gal when it comes to working out. Although I am not competitive runner, running is my go-to outlet for keeping in shape and cross training. For me, running outdoors allows me to recharge, connect with nature, and is one of my favorite ways to cross train and maintain a healthy and active lifestyle. Whether I’m exploring new trails or running the beach trail, I always make the time to do some dynamic stretches. 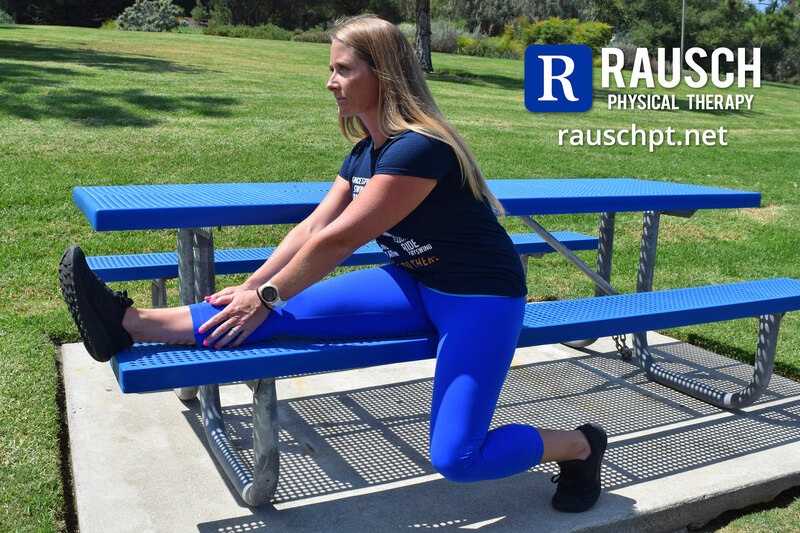 Dynamic stretching before working out can help improve recovery by minimizing overstrain to tight muscles, as well as improve joint mobility to enhance proper muscle recruitment and minimize compensation that can lead to tissue breakdown and injury. Frequently, I will also stop about one mile into my run to help loosen up even more before finishing the end of my run. Incorporating a few stretches after warming up can be helpful for minimizing discomfort for the duration of the run, improving hip drive while running, and improving overall recovery time. Since I am usually exercising outside, I love stretching on picnic tables. 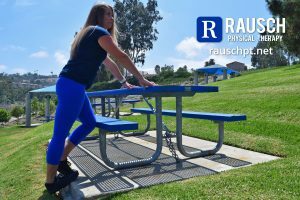 They offer a good surface for stretching with a variety of heights useful for multiple stretches, plus they are convenient since they are virtually everywhere! Glutes are the driving power for running and propelling the body forward. Lack of hip extension results in decreased running efficiency. Tight hip flexors will limit the ability for the hip to extend and use the glutes. A good hip flexor/quad stretch will allow you to engage your glutes more efficiently. Cue: Tilt the pelvis like you’re tucking your tail under. Gently squeeze your glute to help relax the psoas and gain a better stretch. Common mistake: Leaning forward. This results in back extension, not hip extension, which is a common way runners injure their backs. 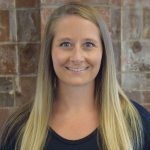 Hamstring tightness is often a contributing factor to back pain or hamstring strains. Hamstring tightness can pull the pelvis into a posterior rotation, which deactivates your abs while running and can lead to back pain over time. Adequate hamstring flexibility will also reduce the amount of tension placed on the sciatic nerve and reduce the risk of hamstring strains while running. Cue: This can also be done as a long duration stretch for 30 seconds to 1-3 minutes. Common mistake: Over rounding the back when leaning forward. This dynamic stretch is important for both ankle mobility and the elasticity of the calf complex. Calf flexibility is important in preventing calf strains while running. Stiff ankles result in poor shock attenuation can result in injury from the foot up to the back. Poor dorsiflexion mobility will shorten the calf and Achilles complex prematurely and can result in calf strain, Achilles Tendon or plantar fascia injury. Cue: Start by standing on a curb or bench, hang the heels off and slowly lower the heel below neutral while bending the opposite knee to raise heel. Alternate dropping the heels to ‘prance’ to improve ankle mobility and calf flexibility. 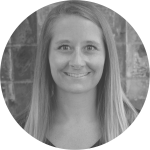 Common mistake: Excessive pronation or flattening of the foot arch. The standing pigeon stretch opens the hip capsule and hip rotators. This will help promote glute activation and hip drive running. Cue: Begin with one leg crossed over opposite leg. The thigh should be perpendicular to the body while the knee is bent at 90 degrees. Holding onto the table, lean back into a partial squat position while maintaining a flat back. 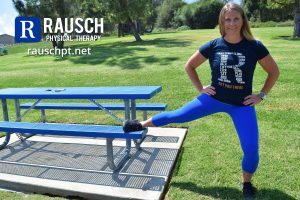 This stretch can also be performed lying supine on picnic table by cross leg over opposite knee, hold thigh behind the non-stretching knee and pull towards chest. 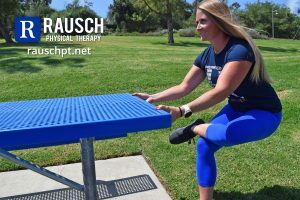 This stretch can also be performed lying supine on picnic table by cross leg over opposite knee, hold thigh behind the non-stretching knee and pull towards chest. Common mistake: Pain in knee. If there is discomfort in the knee, modify by performing stretch on your back. 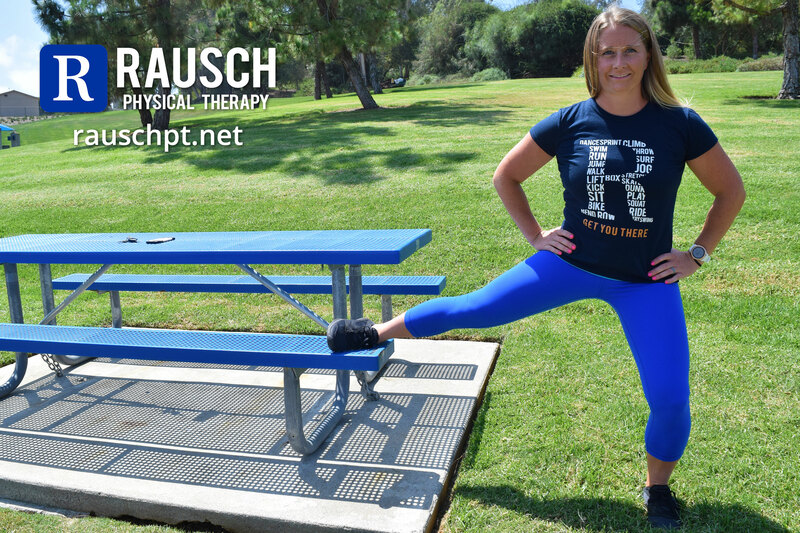 This stretch targets the adductors, which are important for medial knee stability. Adductors can be overlooked when stretching but are important to stabilize the knee to prevent injury. 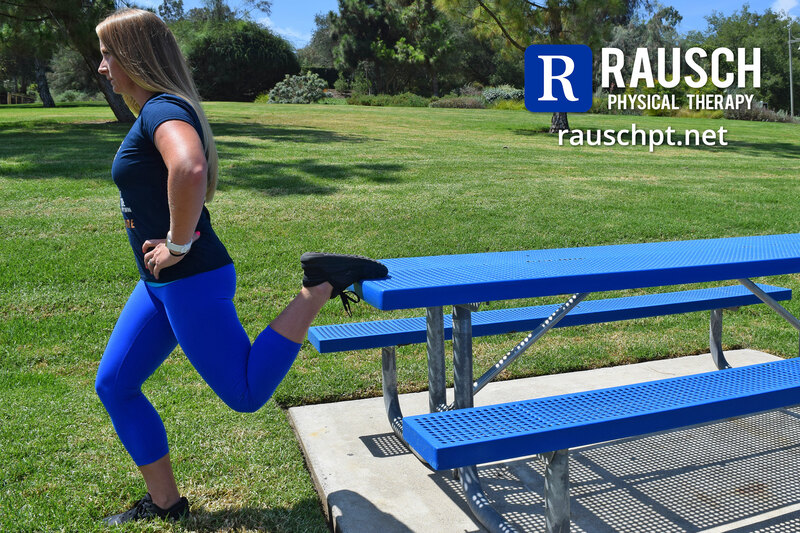 Cue: Using the table, place your foot of the stretching leg on the bench. Lunge away by bending the knee to about 90 degrees, keep your knee stacked over your ankle. This can also be done as a dynamic stretch without the picnic bench by alternating lateral lunges. Alternate to stretch each side 5 times, hold 2-3 seconds before alternating. Common mistake: Going too deep. Knee not stacked over ankle.